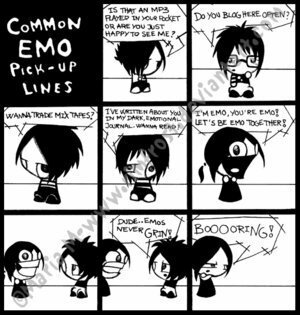 common emo pick up lines. have you heard any of these?. Wallpaper and background images in the Emo club tagged: emo love. This Emo photo contains stained glass window. There might also be holding cell, slot, one armed bandit, slot machine, and coin machine. Um, No. I've never heard any of those 'pick ups'. Bit offensive, don't you think?